A Celebration of Life Services for HazelPlumhoff, 101, of Alpha, Minnesota will be 10:30 a.m. Saturday, February 16, 2019 at Trinity Lutheran Church in Alpha, Minnesota. Burial will be in the Sherburn Cemetery in Sherburn, Minnesota. 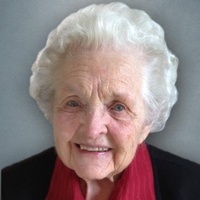 Hazel was called to her eternal rest on Saturday afternoon, February 9, 2019 at the Sanford Hospice Cottage in Worthington, Minnesota. Visitation will be from 5:00 -7:00 p.m. Friday, February 15, 2019 at the Kramer Family Funeral Home in Sherburn and one hour prior to the services on Saturday at the Church. Hazel Marie Amelia Scheff was born on July 13, 1917 to William and Amanda (Klusendorf) Scheff on a farm in rural Sherburn, Minnesota. She received her education in Sherburn Schools. On February 5, 1939, she was united in marriage to Raymond Plumhoff at Trinity Lutheran Church in Welcome, Minnesota. After their marriage they farmed near Welcome, Trimont and rural Alpha until moving into Alpha.Hazel was a very active member of Trinity Lutheran Church in Alpha where she loved her church family. She greatly enjoyed baking, dancing with Ray, playing the piano, reading books especially to her grandchildren, cross stitching, was famous for her caramel rolls, coffee cake, bread, crème puffs, bean soup and malebeedle. She was called “Cookie Grandma” because of her amazing chocolate chip cookies. Hazel enjoyed coffee time at the town hall with all her friends. She is survived by her children, daughter, Sharon Malchow of Jackson, Minnesota, Sonya (Elmer) Welch of Alpha, Minnesota and son, Steve (Marilyn) Plumhoff of Alpha, Minnesota; son-in-law, Larry Winther of Spencer, Iowa; nine grandchildren; seventeen great-grandchildren; seven great-great grandchildren; brother, Gordon (Verda) Scheff of Sherburn, Minnesota; nieces and nephews and other relatives. Hazel was preceded in death by her parents, husband, Raymond on July 12, 2008 and husband for 69 years; daughter, Sheila Winther; brothers, Roy and Richard Scheff; sister, Ruby Thomas; son-in-law, Orie Malchow; five great-grandchildren; four great-great-grandchildren and other relatives. Memorials may be sent to the Sanford Hospice Cottage in Worthington.